A short, 5 to 8 inch height, sod-forming grass. Lives on as little as 12 inches of water per year. It spreads by seed and surface runners. For sunny sites, Buffalograss, Blue Grama and Curly Mesquite are our best choices for lawn grass. See our Native Sun Turf or Thunder Turf for a readymade combination especially suited to this purpose. Texas Bluegrass live roots do well in shaded lawn areas. Buffalo has no natural diseases or pests, does not respond to fertilizer, and withstands extreme heat or cold. Is found from Minnesota and Montana to Mexico. Exotic lawn grasses such as Bermuda and St. Augustine, require 60 to 120 inches of water per year, need frequent mowing, regular applications of fertilizer and pesticides, and can freeze out in harsh winters. Buffalograss prefers loamy or heavier clay soils. Buffalograss is interwoven into American history. Starting with fossil remnants found in Kansas dating back 7 million years ago. Buffalograss (Buchloe dactyloides) was and now once again is the principal forage grass for the American bison, hence the name. Early settlers made use of buffalograss for building their sod homes, while the longhorn cattle grazed it on their way up the Chisholm Trail. It is an important part of the short grass prairie ecosystem. 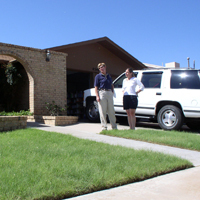 For homeowners with conservation awareness, Buffalograss has become a recognized alternative for turf like lawns. Buffalograss is one of the more popular, short, native, drought tolerant grasses available today. It grows throughout the Great Plains from Minnesota to Montana to Mexico to Manitoba. This native American is a warm season perennial that grows 5-8 inches tall, if you never mow it. Some landscape experts dislike the small male seed heads that appear but their presences is reassuring in these times of genetic engineering. 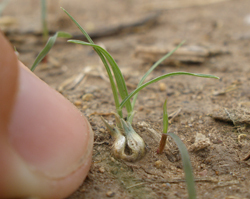 The grass slowly spreads by seed and stolons sometimes called runners. It can survive on as little as 12 inches of rain a year and during extreme dry periods will go dormant until enough moisture is available. This is a highly desirable trait for urban areas when water restrictions are enforced. Its color ranges from a green to blue green color during times of adequate moisture to a pale yellow or straw color when dormant. Buffalograss performs well in a variety of soils but likes the heavier soils best. It does not like deep sand or soils that remain excessively soggy for extended periods of time. Loamy soils are the best but it will perform great in gumbo, red or black clays and in caliche limestone soils too. The best time to plant is in spring or early summer. Two important factors needed to establish a buffalo turf lawn are patience and perseverance. Buffalograss takes longer to make a dense turf but the wait is more than worth it. When established it will require little or no watering, little or no mowing with its low height, no fertilizer, since it doesn’t respond to added fertilizer and it is disease and pest resistant, so no chemical pesticides are needed. 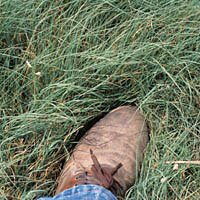 Planting Buffalograss benefits the wallet and the environment.